A major issue that has been coming up in higher education is whether or not colleges and universities should consider standardized test scores in college admission processes. What used to be a universal way to determine if students were prepared for college-level coursework is now becoming a major topic of debate. 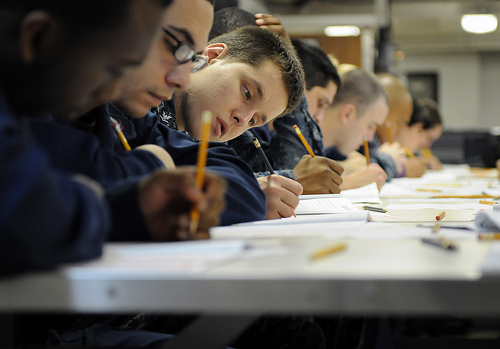 In a 2014 op-ed article posted by The New York Times titled, “We Need More Test, Not Fewer,” the argument is raised that “by allowing students to opt out of testing, we deprive colleges and universities of an important tool to compare applicants, and suggest to young people that self-knowledge isn’t important.” John D. Mayer, a professor of psychology at the University of New Hampshire, highlights several claims supporting the use of standardized tests in the college admission process. The Joy of Learning, taken from Roanoke Times. I strongly disagree with these opinions for several reasons. The first being that a grade on a standardized test does not equate to a student’s full potential. According to Dr. Camille Charles @CamilleZCharles, “the SAT is not an IQ test.” There is widespread consensus that the SAT/ACT are simply a measure of how well an individual has prepared to take the test and offers unfair advantages to students who pursue prep courses or advanced preparation in high school. Not only that, but many college students can attest to the fact that these standardized tests are not encountered again in any college curriculum and certainly have no connection to their first semester grades. Hey, inventor Thomas Edison was told he was “too stupid to learn anything,” but succeeded in producing over 1,000 inventions. So what does that tell you? This new approach can really have a positive outcome and encourage many students to apply and gain a higher education. There are many potential students that are discouraged from applying to colleges that require a test score. Maybe it’s because they are not comfortable taking the SAT or ACT. Whatever the reason is, Thomas explains how it’s suspected that many potential students who would succeed in college are not applying. Research by psychologist Claude Steele, dean for the School of Education at Stanford University, has also states that underrepresented groups are more likely than others to be put off by test score requirements. If eliminating standardized tests as a required element of the application would increase the number of highly qualified applicants to college, increase the quality of the enrolled freshman class, and increase the diversity of that class…then what are schools waiting for?